Aside from the small bowl of miso soup that comes with your sushi, miso on its own is often overlooked. “Miso” directly translates to “fermented beans” in Japanese and is a key ingredient in Asian cuisine. Packed with essential vitamins and minerals that can improve your overall health and even happiness, there’s no reason not to pick some up the next time you’re in the grocery store. Here’s everything you need to know about miso before adding this super-paste to your diet. The power of miso is no hidden secret. In fact, people in Japan start their morning with a cup of miso soup to stimulate their digestion and energy levels. Loaded with digestive enzymes and probiotic cultures, the fermentation in miso is said to improve digestion and even chronic conditions such as leaky gut or gut dysbiosis. 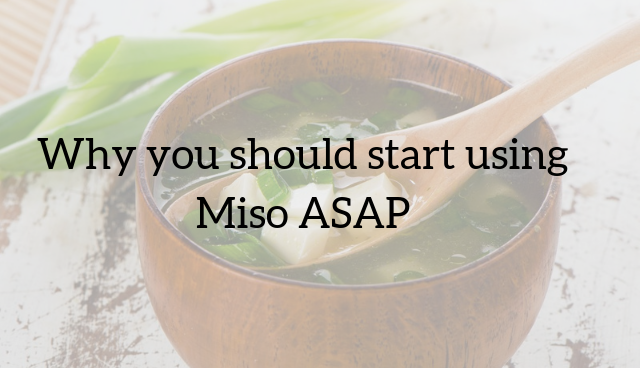 Miso is also said to have antioxidants that can reduce inflammation, and lower both cholesterol and glucose levels. The vitamins and nutrients in miso such as B vitamins, iron, zinc, protein, and electrolytes can improve not only your immune system, but also lead to healthier, glowing skin and a happier mind. It also makes for a great hangover cure. No miso paste is created equal. The length of fermentation and variety of ingredients can vary in the pastes, which can affect its flavor, color and texture. Don’t be deceived by the name—white miso is actually light yellow in color. With the shortest fermentation time, this paste is more mild and sweet in taste. If you want a miso to use in a wide variety of recipes, this is your best bet. Made from fermented soybeans and barley, the flavor of yellow miso is stronger than white miso, but can still be used for the same recipes depending on your taste preferences. This type of miso offers the strongest flavors of the its other miso counterparts because of its longer fermentation period. With a saltier and richer taste, use a little bit of this miso with heartier dishes. When choosing miso, try to check the ingredients to make sure no additives like sugar or MSG are added. Store your miso in the fridge and place a piece of plastic wrap directly on top of the paste to ensure a longer shelf life. Although the paste may be a little tricky to find, this “live” food doesn’t really go bad if stored properly. The salty and umami notes of miso can be a good additive to many different dishes, dressings, and marinades. Depending on how much you use, miso can even add some sweet and earthy tones. Just make sure not to use too much as the paste can easily overpower other flavors. Tip: To keep the most amount of nutrients in tact, avoid boiling miso. Instead, simmer it over low-heat before adding it in to your soups or dishes. One of our favorite recipes is this cold miso-sesame noodle recipe. I promise you’ll be hooked in no time. So put down your multivitamins and your bottle of soy-sauce and pick up a jar of miso instead. You won’t regret it.